Good morning, friends. My apologies for the quick disappearing act here. I had an experience early last week that has forced me to slow down and take a step back. Things here will look a bit differently from here on out and I don't really know what that will look like, I just know that I have scaled back in order to listen to my heart, body, and mind, and take better care of myself. So, I'll pop in when I can and share things that I create for fun, when I want to and hope that you'll enjoy whatever it is that I have to offer :). I have used the sweet, new Papertrey Ink Worth the Wait and Even More : Worth the Wait stamp sets on my card today. Baby cards are so much fun to create and a set dedicated to all things baby is just delightful. I stamped in Pale Peony, Lilac Grace, Lavender Moon, and Spring Moss. The heart in the background is from the You Have My Heart die collection. This set is so heartwarming! This next card is just for you, my dear, sweet, long-time supporters and friends. You truly have brought me so much joy, support, and encouragement over the years and there is absolutely no way I could ever thank you enough for what you have done for me. I have used the new Frame it Out: What's Inside? stamp set and coordinating dies on this card. Papertrey Ink has also come out with the Nesting Basics: Pierced Ovals and Ovals dies, which I've used here. The new Frame it Out: What's Inside stamp set was used around the outer edge of my largest oval. I stamped my sentiment on a smaller Nesting Basics: Pierced Oval and Oval die and added a second sentiment on a die cut Wine Bottle Tag II die using a sentiment from the new Sentiment Staples: Just a Note stamp set. My flowers and fun pinwheels are from the new Let's Fiesta stamp set. Sending you my love and gratitude! Morning! Welcome to Day 1 of Papertrey Ink's January release. We're starting it off with a beautiful set called Let's Fiesta. This set is full of possibilities, from fun and playful to sweet and flowery. I've chosen to use the tiny basket found in this set, stamping in Fine Linen and Classic Kraft. I then added stamped and die cut flowers from the set to fill my basket. I layered my basket of flowers over Lemon Tart, vellum, and Stamper's Select White cardstock, cut using the new Shape Shifters: Square 4 dies. Across the bottom I stamped my sentiment in Summer Sunrise. I added flowers and a bow to embellish and tie all of the images together. 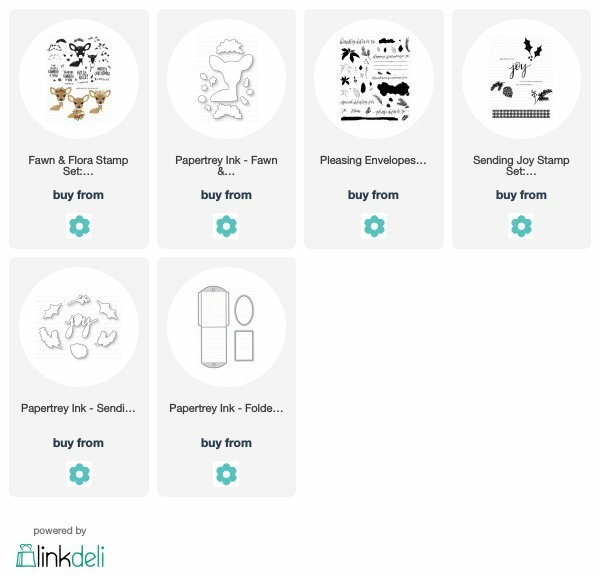 You must stop by and visit the Papertrey Ink blog to see lots of delightful projects created with this sweet stamp set. All new products will be available on January 8th, 10PM EST. Morning! Welcome to the January Reverse Confetti blog hop! My card today uses a few of the new sets combined together. I began with the Scalloped Squares Confetti Cuts and used the largest one to frame in my hearts. I stamped a couple of images from the new Love You Most stamp set and framed them in using hearts cut using the new Patterned Hearts dies. I used paper from the new From Cupid 6x6 Paper Pad. Lastly, I added flowers stamped and die cut using the new Happy Bee Day stamp set and colored using my Copic markers. So many sweet new products to enjoy and they're all now available at Reverse Confetti! Hello friends! Today's post from Reverse Confetti showcases the new Happy Bee Day stamp set and coordinating Confetti Cuts. It's just the cutest set with the most unique sentiments! You know how I love to paper-piece! So for my tiny honey jar, I used patterned paper to bring in color and pattern, plus a bit of coloring with my Copics. I created a focal point by using the Fa La La Circle Confetti Cuts layered over cardstock created using the Lacy Scalloped Circles Confetti Cuts. After stamping my sentiment, I then ran my die cut circle through with the new Diagonal Stitches Cover Panel. Lastly, I stamped and die cut some sweet flowers from the new Happy Bee Day set and added color with my Copics. I added them around my honey jar as well as sequins to finish. Truly such a sweet set...perfect for friendship cards I think. Be sure to leave comments on the designer's blogs as well as on the Reverse Confetti Facebook page to be entered to win a $15 Reverse Confetti gift certificate. Hey there, Valentine! Welcome to Day 2 of the January Reverse Confetti Release. I've used the sweetest set ever on my card today, it's called Big Bear and I adore it. I paper-pieced my bear and his scarf and attached him to a die cut Pierced Round Top Layer. My sentiment was stamped vertically down the side and is from the new Heart Pals stamp set. The flowers are from another new set you'll hear more about tomorrow :). In the background, I've used the new Hex Cover Panel and added bits of patterned paper from the new From Cupid 6x6 Paper Pad behind each window. I finished with tiny hearts, cut from the XOXO Hearts die, sequins, and trimmings. Be sure to leave comments on the designer's blogs as well as on the Reverse Confetti Facebook page to be entered to win a $15 gift certificate to Reverse Confetti! Good morning! It's Day 1 of the Reverse Confetti January release. 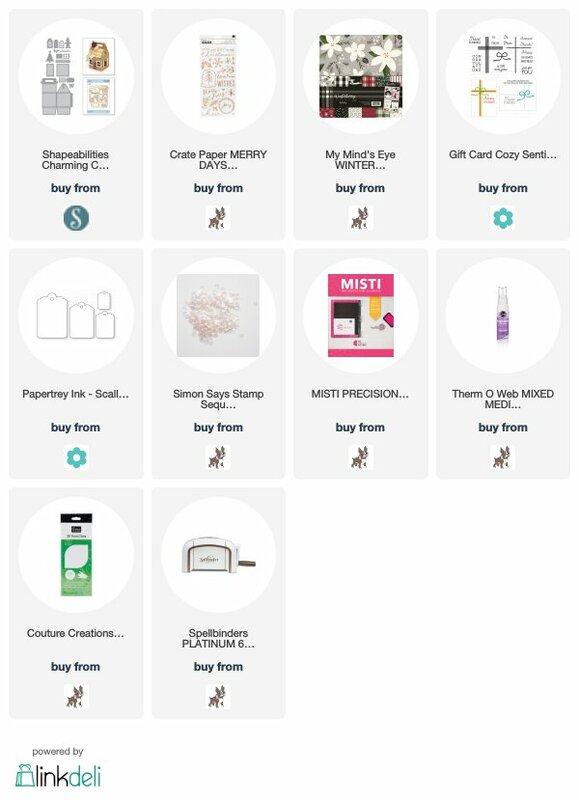 I am crazy about all of the sweet, new products coming your way! They'll all be available on January 8th! My card today uses the delightful, new Patterned Hearts stamp set and coordinating Confetti Cuts. I stamped my heart using Salsa Ink and then added my sentiment across the front using Midnight ink. I love all of the fun mix and match patterns in this set along with the dies which make this set even more fun to use! I added a few flowers beneath my heart using the Blooms 'N Buds stamp set and Confetti Cuts. My leaves are from the Mod Floral Stacks stamp set, with the veins from the Blooms 'N Buds. I layered my images over a Pop Up Circle, Fa La La Circle, and Linked Circles Cover Panel Confetti Cuts. The fun paper behind my heart is from the new From Cupid 6x6 Paper Pad...a must have too! Be sure to leave comments on each designer's blog as well as on the Reverse Confetti Facebook page...there will be a $15 gift certificate given away to one lucky reader! Thanks for visiting! Hello and Happy New Year's Eve Eve! My card today uses the new Always and Forever stamp set from Simon Says Stamp's You Are Loved release. This sentiment just has my heart in every sense of the word...makes me think of my sweet guy. Along with the fun sentiment, I used Banner in Bloom for my florals from Reverse Confetti, stamping them in watermark ink and heat embossing them using white embossing powder. I then sponged color over my images and added water and watercolor markers. In the background, I used more florals from the Elegant Florals stamp set from Reverse Confetti along with patterned paper and vellum to soften the colors. Hello! Just sharing a sweet card created with the new Bixby Background die from Simon Says Stamp DieCember collection. I heart it! I die cut it from the center of a die cut Spellbinders Eau de Lavende die...it's the precious, detailed floral in the center. At the top and bottom, I added stamped and die cut flowers using the Elegant Florals stamp set from Reverse Confetti. I then stamped my sentiment on a die cut banner and added it to the center of my card, followed by a die cut heart, cut using the XOXO Hearts Die. All of the supplies used can be found at the end of my post. Happy last few days of DieCember! Morning! I'm here with Throwback Thursday from Papertrey Ink. Today a few of the design team members are revisiting the lovely, O'Tannenbaum stamp set. I adore this beautiful stamp set...it's been a favorite of mine since it was first released. I stamped the trunk for my tree on a die cut Shape Shifters: Oval 3 die, cut from Stamper's Select White and using Classic Kraft ink. I then heat embossed the sparkles for my tree three different times, each time using a different color of embossing powder. I used Salsa from WOW!, Shabby Green Embossing Enamel from Stampendous, and metallic gold. I then stamped my sentiment using Olive Twist ink on a Wine Bottle Tag 2 die cut. I added metallic gold and silver die cuts, cut using the Embellished Elegance, Silver White Wishes, and Shaped Sayings: Christmas dies. To finish, I added in vintage buttons and opaque sequins. Supplies are all listed for you below. Sadly, I think this may be the last Christmas card for the season :(...they're my favorite theme to create! Hello! 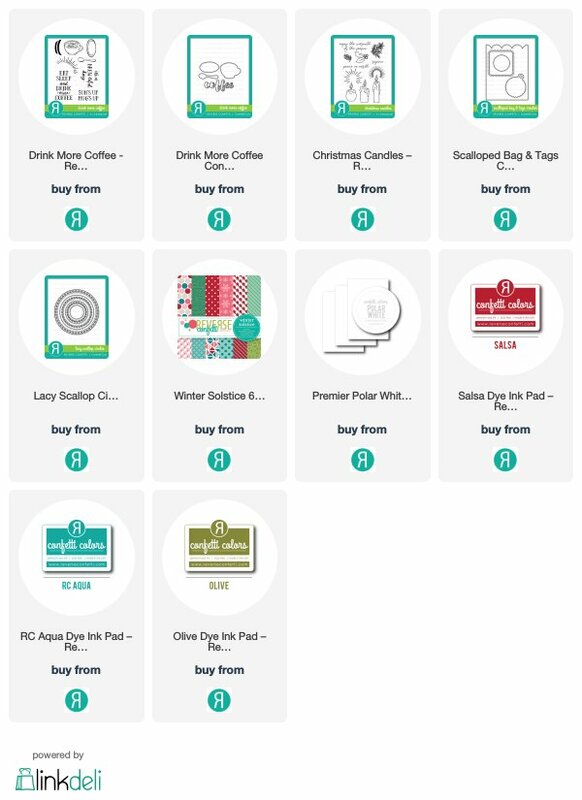 I just had to stop in and tell you all about the 12 Days of Holiday Giving taking place at the Scrapbook & Cards Today blog. This is such a fun event and I'm happy to be taking part in it. My project was created for the event and you can find all of the details there. I've used the darling Charming Cottage Box Etched Die from Spellbinders. It's my newest gift-packaging crush :). I created my little cottage using Crate Paper and My Mind's Eye supplies. The fun, metallic puffy stickers are also from Crate paper...gotta have these in my stash at all times, they're so cute. My tag was created using the Scalloped Tag Die and Gift Card Cozy Sentiments stamp set from Papertrey Ink. Visit the SCT blog for more details and enter to win some fun holiday giveaways! It's the week before Christmas and I hope you're all enjoying a bit of calm and quiet amidst the madness that often comes with preparing for Christmas. I've had a bit of time to create over the weekend and have been enjoying my Spellbinders December Card Kit. 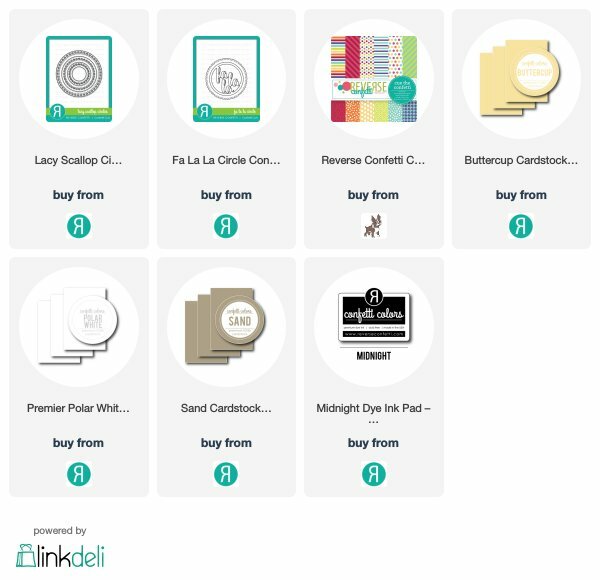 The Spellbinders Card Kit of the Month is always so much fun to open and is full of dies, die cuts, stamps, cardstock, paper, and oodles of embellishments. The kit for December is my newest favorite. It's filled with tiny polar bears, mason jars, pine sprigs, snowflakes, metallic gold, and so much more. My sentiment comes from the stamp set found in the kit and I cut my tiny snowflakes, felt flowers, and pine sprigs from the gorgeous metallic cardstock found in the kit as well. The delightful paper and die cuts...also all from this sweet kit. I'll have more projects coming soon using this kit....it's perfect not just only for the holidays, but the cold, January month of winter as well. Morning again! It's the final day of the December release from Papertrey Ink. 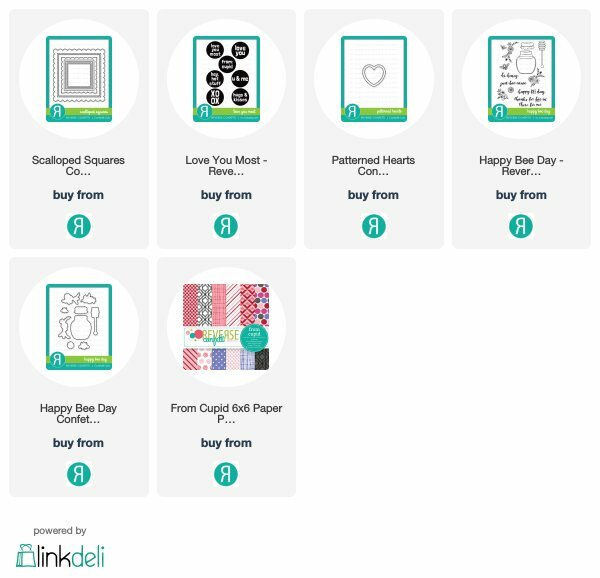 Today I have the pleasure of sharing the new You Make My Heart Soar stamp set and coordinating dies with you. My tiny balloons are stamped in Aqua Mist, Sweet Blush, Pale Peony, Raspberry Fizz, and Hibiscus Burst. I layered them over my heart background, cut using the new Bold Borders: Love Die (cut from Berry Sorbet cardstock). I used individual heart stamps from the You Make My Heart Soar set. I then used the new Corner Adorners: December stamp set and dies to create some scallops around my frame. My sentiment comes from the new Penned Elegance II stamp set....love the coordinating dies for this set :). I love the sweet balloon bouquet image in this stamp set and used it in the center of my Pierced Feature Frames: Oval die. They're layered over some fun heart print paper I had in my stash. I used the Corner Adorner: December stamp set to create the scalloped border down the edges of my card. I stamped them in Pure Poppy and just love how they turned out. I stamped my sentiment on a die cut Tremendous Tag using Raspberry Fizz ink to finish. Lastly, I used the balloon images to create a background for my die cut heart, cut using the new From the Heart die. I then layered on a vellum and felt heart topped with a button. Behind my heart I added die cuts using the Delicate Dies and attached the hearts and Delicate Dies to a Mix & Mat: Confetti Die. At the bottom of this I added a sentiment from the XO Skinny Mini stamp set, stamping it in Pale Peony ink. Once you start stamping these tiny balloons, you'll have to try them in every color :). Right now, I think yellow are my favorite. I used the XO Skinny Mini stamp set and coordinating dies and added a tag to my card...I LOVE layering and these tags are perfect for just that. All of these new supplies will be available on December 15th, 10PM EST. My first tag uses the fun Corner Adorner: December in the corners of my tag. I used Raspberry Fizz for my scallops and Spring Moss for my inserts. I layered them over a Noted: Pinked A2 Vertical die cut. I then used the From the Heart dies for the center of my tag, using patterned paper and felt. I just love the XO Skinny Mini tags and stamps...they are fun and trendy and make layering over larger things a snap. I added in Autumn Rose cardstock hearts, cut using dies from the Perfect Match die collection. My second tag uses a different XO Skinny Mini tag and sentiment. I love the angled bottom edge on this die. I began with the Shape Shifters: Circle 3 die and Bitty Big Sweet Blush paper to create my tag base. I then used the new Nesting Basics: Circles and Pierced Circles dies to create a frame for my die cut hearts. They were also cut using the new From the Heart dies, with images from the XO Skinny Mini stamp set used on my Sweet Blush heart. Behind my hearts I used the new Delicate Dies...they are so pretty. All of these new products will be available on December 15th, 10PM EST. Good morning! All the heart eyes for the sweet, new products available at Papertrey Ink this month. All of these delightful treats will be available on December 15th, 10PM EST. My tag uses the new From the Heart stamp set and dies along with the Sentiment Staples: I Love You stamp set. My tag base was created from the new Shape Shifters: Oval 4 dies, with my base layer created from Sweet Blush cardstock and the top layer cut from Stamper's Select White cardstock. I used the From the Heart dies to create my large white and small aqua heart, with the Raspberry Fizz heart stamped in between. I stamped a portion of my sentiment on the Aqua Mist heart, using images found in the From the Heart stamp set. I finished my sentiment by using the Sentiment Staples: I Love You stamp set and the Wine Bottle Tag II die. 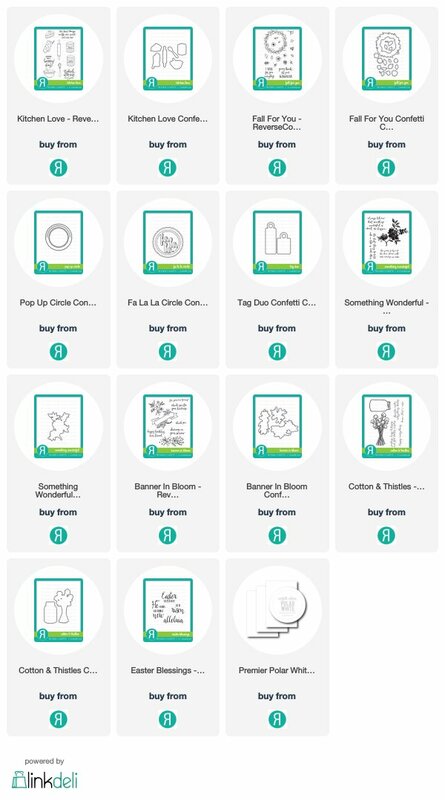 For my next card, I used the fun, new Everyday Elixir Labels along with the Nesting Basics: Circles and Nesting Basic: Pierced Circles dies. I framed in my sentiment from the From the Heart stamp set by die cutting a heart in the center of my Sweet Blush circle. The tiny Aqua Mist hearts are from the Everyday Elixir Labels stamp set. Across the bottom of my card, I used the stamping-off technique combined with the Everyday Elixir Labels and Wicked Elixir stamp set. In the background, I used the Bold Borders: Polka Dots die, cut from Aqua Mist cardstock and layered over Sweet Blush cardstock and Sheer Basics Vellum. These new products make creating so much fun. I've always been a sucker for hearts and pink! It's Day 2 of Papertrey Ink's December release and love is in the air! My first card today uses the new Love in Bloom stamp set and coordinating dies. I just love the sweet heart created from flowers and the darling font used on the sentiments. I stamped my heart in Autumn Rose, Lilac Grace, Pale Peony, Hibiscus Burst, Spring Moss, and Prairie Grass. I layered it over a white circle cut using the new Nesting Basics: Circles and Nesting Basics: Pierced Circles dies. I used the new Shape Shifters: Oval 4 dies in the background, stamping my sentiment across the bottom using Autumn Rose ink. Across the top I used Chicken Scratch Gingham paper to bring in pattern and dimension. My tiny, glittered hearts were cut using the new Bear Hugs dies. Next, I created a tag using the new Perfect Match stamp set and dies. This set is so much fun and perfect for sweet, Valentine's Day cards and treats. I used the new Text & Texture: Bokeh stamp set on my Melon Berry cardstock base that was adhered to a tag cut using the Tag Sale: Quilted die and Chicken Scratch Gingham. I stamped my sentiments from the Perfect Match stamp set on a die cut Tremendous Tag and at the bottom of my tag, I used the fun Nesting Basics: Circles and Pierced Circles once again to create a focal point for my matches. So much fun! All of the new supplies will be available for sale on December 15ht, 10PM EST. More coming tomorrow! Hello! Welcome to Day 1 of Papertrey Ink's December release. The products this month are going to make you swoon! My first card today uses the new Text & Texture: Bokeh stamp set in the background. I LOVE stamping with this set...it really sparks my creativity and I love how the images turn out each time. I stamped my Bokeh on Lemon Tart cardstock using Lemon Tart, Bright Buttercup, and a bit of Summer Sunrise ink. I then used the Noted Pinked A2 Vertical Die Collection to cut my Bokeh for my white cardstock base. My sentiment across the center of my heart and across the bottom is from the new Words to Live By: Happiness stamp set. I used the new Nesting Basics: Circles to create my focal point...the heart is also from a new die collection you'll hear more about soon. My florals come from the Fantasy Floral: Christmas stamp set. These bright, fresh colors are a nice change from holiday colors :). On my next card, I used the new Penned Elegance II stamp set and the new Delicate Dies die collection. I snipped my Delicate Dies in half after die cutting them from white cardstock. I then attached them behind a double layer of die cut hearts cut from Bitty Big Aqua and Lemon Tart felt. I love the Penned Elegance series and this second addition is just as beautiful as the first. I stamped my sentiment in Pale Peony ink after die cutting it. In the background, I used the new Text & Texture: Bokeh stamp set again, this time using single images from the set, stamping in Lemon Tart, Aqua Mist, and Sweet Blush. The new Shape Shifters: Oval 4 dies were used for my background as well. Thanks for visiting! I'll have more throughout the week. Hello! Welcome to the December Reverse Confetti Blog Hop! Our hop is a fun one this month as we have each created a new project for you and are sharing our 3 favorite projects from 2018. This year has gone by faster than the others it seems! 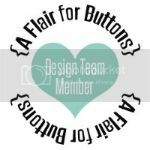 For my new project, I created a tag using the Kitchen Love stamp set and coordinating dies. This has been one of my most favorite sets and since I love to bake, it fits in perfectly around here. I paper-pieced my mixing bowls and added color using my Copics to my rolling pin, wire whisk, and flowers, which are from the Fall for You stamp set. I added the wreath from the Fall for You stamp set in the background, wanting to create a Christmas-themed tag for my fresh baked goodies. 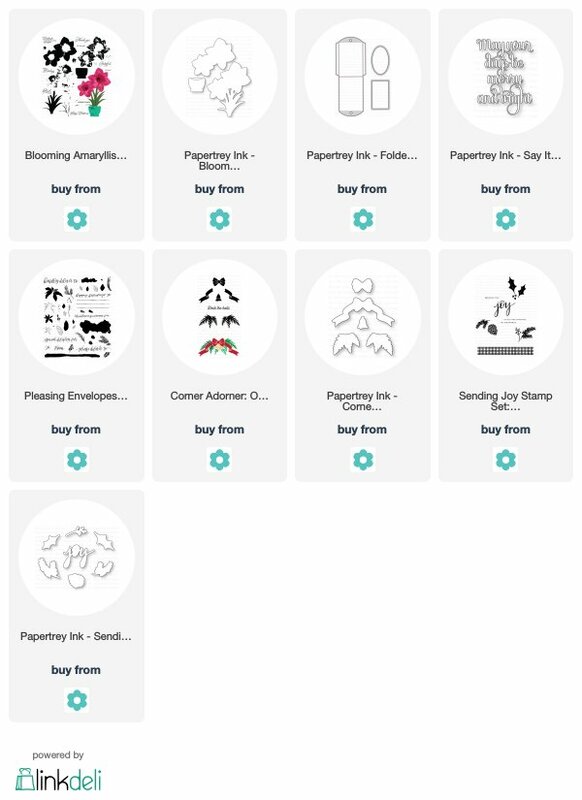 The supplies used on this project as well as the stamp sets used on my following projects are listed for you at the end of my post. One of my favorite projects from 2018 is my handmade Easter gift bag. I remember experimenting with water-colors as I was creating this, and loved how the Banner in Bloom stamp set looked using this fun technique. My next favorite project from 2018 was this card created using the Cotton & Thistles stamp set. I fell in love with this set instantly, and knew I'd love creating with it. I also remember a sweet comment my mom made about this card and I popped it right in the mail to send to her...one of the other reasons I love this card :). Lastly, this card was created using the Something Wonderful stamp set and it has to be the most gorgeous floral stamp set I have ever seen. The sweet sentiments in this set make it another special set that very easily creates unforgettable cards :). 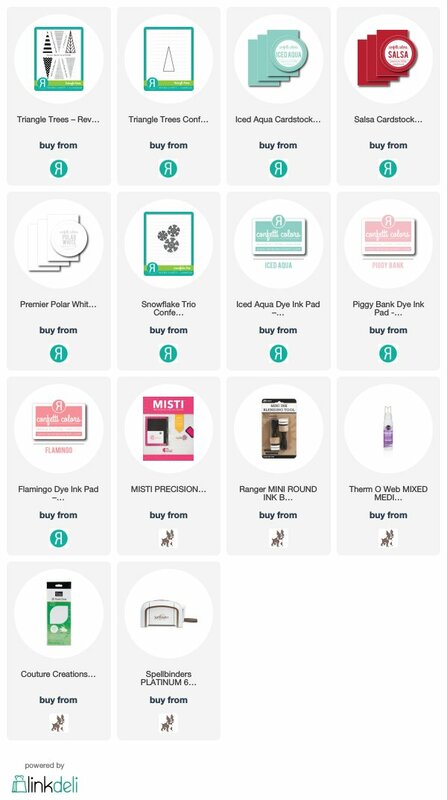 The blog hop order is listed for you below. Thank you so much for stopping by and for joining me today! Morning! It's my turn for Papertrey Ink's Transformation Tuesday. I chose to use a card I created just a couple of months ago, using the basic design elements as my inspiration for a whole new card. Here is my original card. You can find the post with the supply list HERE. I had so much fun creating this card, that I knew I'd want to try it again sometime soon and just swap out the colors and stamped images. I used the Shape Shifters: Square 3 die once again, layering it over a card base created with Stormy Sea cardstock. I used the Fairy Tale Stencil Collection on my card base, stenciling snowflakes with Ocean Tides ink. I added in Bitty Big Ocean Tides paper across the center or my card followed by die cut hearts from the Limitless Layers: 2 1/4" die collection. My sentiment comes from the Beautiful Berries: Winter stamp set and over the top of my sentiment, I used stamped and die cut images from the Corner Adorner: October stamp set. I had a scrap of paper in my stash that tied in perfectly with the colors of my card, so I added that across the bottom. Hope you'll try using your own cards as inspiration...follow the basic sketch of the card, or use the same colors in a favorite card, or repeat a card using the same stamped images, but just mix up the colors a bit...you are your greatest source of inspiration! Good morning! I'm up on the Papertrey Ink blog today with a Make it Monday to inspire you as you create your holiday cards. This time of year, we deck our halls to dress up our homes. For today's tutorial, we are decking or dies to dress up our cards for the holidays! There are step-by-step instructions on the PTI blog. My first card uses the Joy die from the Bold Borders: Flurries die collection. I've dressed up this die by die-cutting it from patterned paper, Bitty Big Spring Moss. One thing to be aware of, is to choose a small pattern for your word die cuts, so the word doesn't get lost in the busy pattern of the paper. I added some embellishments to my Joy die cut by adding felt cut leaves and gems to resemble holly and berries. I then stacked stamped and die cut trees from the Enchanted Forest stamp set across the top of my Joy die cut. I love how they sprout upward, following the shape of the word die cut as they go. My next card uses the beautiful Big Basics: Merry Christmas die, cutting my sentiment from gold metallic cardstock. There are so many different mediums you can use with these word dies. Think about glittered cardstock, corrugated paper, patterned paper, metallic cardstock, etc. I added character to my die cut sentiment by embellishing with florals from the Floral Fantasy: Christmas stamp set as well as the Forest Floor: Winter stamp set. I hung stockings from the base of my die cut sentiment to mimic stockings hung by the fireplace. I used the Warm & Fuzzy stamp set and added in a few berries and leaves by using the Sending Comfort stamp set. Across the bottom of my card I added a subtle border by using the Fair Isle Borders stamp set. The texture created in this set adds dimension and warmth. There are so many fun things you can do with your word dies....think outside of the box whether it's for the holidays or for occasions throughout the year. Enjoy creating! Hello, my friends, and Hello December! What a glorious month of kindness, goodwill, and giving this is. Throughout the month, I will be sharing a few thoughts with you as I participate in Light the World with the Church of Jesus Christ of Latter-Day Saints. This week, I will be trying to Light the World through my testimony here on my blog...perhaps it will touch someone near or far. And tomorrow night, Sunday, December 2, there is a Christmas Devotional broadcast HERE from the First Presidency of The Church of Jesus Christ of Latter-Day Saints that I can't wait to watch with my family and hope you'll tune in too. It is a sure way to let your heart be light and bring you comfort and cheer. This sentiment is a favorite of mine because of the JOY the world received and continues to receive because of the beautiful, babe born in Bethlehem....our Savior. I owe Him my life...He is my joy and my best friend. Without Him, I would not have what I have today and not be who I am today. My card today was created for Spellbinders using the gorgeous, new Amazing Paper Grace Die of the Month for December. There are so many things you can do with this collection of dies, and I've just got one example for you here today. I used silver metallic cardstock along with the lovely dies in the kit for this month...they are so intricate and detailed and create stunning cards quite simply. The center wreath and flowers are also from the kit. My sentiment is from Papertrey Ink's Penned Elegance: Christmas and the Wet Paint Holiday stamp sets. The stamped flowers in the background are from the Floral Fantasy: Christmas stamp set. The Amazing Paper Grace Kit of the Month Club is a new club to Spellbinders but the one I look forward to most each month...shabby, elegant, detailed, timeless! To end, I would love to leave you with a quote that I love by James E. Faust back in December 2001. "We all enjoy giving and receiving presents. But there is a difference between presents and gifts. The true gifts may be part of ourselves--giving of the riches of the heart and mind--and therefore more enduring and of far greater worth than presents bought at the store. Of course, among the greatest of gifts is the gift of love..."
Merry Christmas and Joy to the World! Morning! 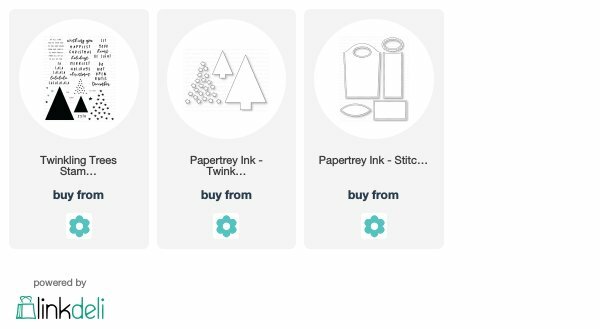 Christmas is coming and today's Simple to Spectacular from Papertrey Ink is timed perfectly! We've pulled out the lovely Painted Poinsettias stamp set and have projects ranging from simple to more complex in nature. My approach to this challenge might be a bit different than the rest, but I've added a new technique to each of my cards, with the simplest first and ending with the more complex last. My first card uses a fun and simple layering technique using the blooms from the Painted Poinsettias stamp set and the Cover Up: Quatrefoil stamp. I stamped my poinsettias using the same colors for all of my cards, Pale Peony, Hibiscus Burst, Autumn Rose, Pure Poppy, Autumn Rose, Scarlet Jewel, Aqua Mist, Simply Chartreuse, Ripe Avocado, Bright Buttercup, and Saffron Spice. After stamping my blooms, I then stamped my card base with the Cover Up: Quatrefoil using Sweet Blush ink. I love the soft, subtle, layered look. I then stamped my sentiment on a die cut Scalloped Tag and finished with die cut photo corners from the Make it Market: Fairy Tale Christmas kit. This card is a bit more detailed because I added in stenciling over the Cover Up: Quatrefoil stamp. I used stencils and Indian Gold Nuvo Embellishment Mousse from the Make it Market: Fairy Tale Christmas kit as well. I love the bit of shimmer the gold, stenciled snowflakes add to my background. I also added in some vellum and patterned paper, which is another way to step-up your cards. I used the To the Point: Edgers II die that adds a simple but decorative border. I only stamped a portion of my poinsettias on my die cut Scalloped Tag because I wanted the beautiful background to stand out just as much as the flowers. On my last card, I heat embossed the center veins on each poinsettia leaf using watermark ink and gold embossing powder. I added more dimension to this card by die cutting my flowers and leaves using the coordinating die cuts. Once again, I brought in patterned paper, using Bitty Big Sweet Blush in the background, and then added in a beautiful layer of holly berries, leaves, and greens by using the Bold Borders: Yuletide die. The Bold Borders dies are so fun and add lots of character in very little time. The fun die cut photo corners made an appearance on my last card as well. They are such a fun finishing touch. Thank you so much for visiting. Be sure to stop by the Papertrey Ink blog for more projects using the delightful Painted Poinsettias stamp set. Good morning! Today I'm sharing a new love of mine, the Spellbinders Amazing Paper Grace Die of the Month Club. My card was created using the November Kit and it is so beautiful! I love the story book feel and intricate detailed dies. It's just completely enchanting. I wanted to keep the colors soft so as not to detract from the beautiful dies, so I created an ombre pink background and accented with glittered pink cardstock, gold foil cardstock, soft black, and white. The kit comes with lots of options as far as the tiny dies that help build your scene, and I've just used a small portion of them here. I loved the look of the church set up on a hill on a silent, snowy night. I added some snowflakes using the Amazing Paper Grace Yuletide Snowflake Dies from Spellbinders....I can't quite get enough of these either :). My snowy background was stamped using the Winter Window stamp set from Papertrey Ink. It's the last day of Papertrey Ink's November release and today's products are just as sweet as can be. If you ever struggle with creating sympathy cards, these sets are the answer. I love them and have been so inspired by them. My first card uses the new Words to Live by: Caring stamp set and coordinating die. I stamped my sentiment and attached my die cut word on a heart cut using the You Have My Heart die. It was cut from Autumn Rose cardstock and I added a bit of shading using the ink blending technique and Autumn Rose ink. My sentiment was stamped using Scarlet Jewel and I cut my "caring" from white glitter cardstock. I layered my heart over the new Shape Shifters: Circle 4 die cut....love this! Across the bottom, I used a sentiment from the new Expressions of Empathy stamp set, stamped on a Double Ended Banner die cut. I love the florals in the new Forest Floor: Winter stamp set and added a few at the bottom of my heart, stamped in Scarlet Jewel from Kraft cardstock. My tiny Vintage Cream felt flowers and Simply Chartreuse felt leaves were cut using the Floral Fantasy: Christmas die collection. My next card uses the new Expressions of Empathy stamp set once again. I just love the sentiments in this sweet set and the font used is beautiful too. In the background, I used the new Bold Borders: Polka Dots die, cutting it from Harvest Gold cardstock and layering it over a white cardstock base. I cut it a second time from Aqua Mist cardstock and used the tiny cut outs to add a bit of color to my background. I created my focal point using the Mix & Mat: Postal die and white carstock. I then used the center circle from the Shape Shifters: Circle 4 die collection and ran in through with my postal die cut with the circle just placed in the upper corner, to resemble a sun in the corner of my card. I sponged Bright Buttercup and a bit of Summer Sunrise ink inside my circle and then stamped hearts from the new Corner Adorner: November stamp set inside my sunshine. Next I used the ray images from the Corner Adorner: November stamp set and stamped them to resemble the rays of my bright sunshine. To finish, I added tiny birds from the Home to Roost stamp set, stamping in Pure Poppy and Hawaiian Shores and added them to a branch, cut using the Forest Floor: Winter stamp set. That will do it for my for another month. All of these new products will be available on November 15th, 10PM EST. Good morning! I have a few projects to share with you today using the sweet, new Home to Roost stamp set and coordinating dies from Papertrey Ink. I used the new Shape Shifters: Circle 4 die to create my first tag, using the sweet birdhouse, sentiment, and felt flowers cut with the Floral Fantasy: Christmas stamp set. My next tag was created with the new Mix Up Pocket Tags. The Scalloped Tag die is just the right size to fit down inside these fun pocket tags. I thought the Home to Roost stamp set would make such a fun Christmas card, so for this next project, I paper-pieced a birdhouse and attached it to my Shape Shifters: Circle 4 die cut. My birdhouse is nestled inside a stamped Twig Wreath and embellished with flowers from the Floral Fantasy: Christmas stamp set. My sentiment is from the Enchanted Forest stamp set. The Background Basics: Celestial Sky stamp set was used to create my faux snow, which I heat embossed in white on a Smokey Shadow backround. Lastly, I created a baby card using the darling elements and sentiment from Home to Roost. I used the new Nesting Basics: Rectangles and Nesting Frames: Pierced Rectangles dies to create my background. I love these dies! I used Stamper's Select White for my base, followed by Bitty Big Aqua Mist, and ended with Sheer Basics Vellum. The Shape Shifters: Circle 4 die makes such a perfect base for your focal points. And, I love the image of a mother bird with her eggs when celebrating the arrival of a new baby :). All of these new products will be available on November 15th, 10PM EST. More to come tomorrow! Welcome to another fun-filled day of new releases from Papertrey Ink! Today we are sharing the darling, new Fence Line: Winter stamp set. It's just about the sweetest thing I have stamped with :). I used the Pierced Feature Frames: Ovals to create my focal point for my fence, tiny bird, and snowman. I stamped the outer oval using snowflake images found in the Glorious Globes: November stamp set. My sentiment comes from the Sentiment Staples: Warmest Wishes stamp set. The second half of the sentiment is stamped on a die cut using the new Skinny Mini Banners die. At the top of my oval, I added the boughs from the Fence Line: Winter stamp set and a stamped and die cut bow using the Gift Card Cozy Sentiments stamp set. This card needed a few snowflakes and such to finish it up, so I used the Snowfall Style II die and Melon Berry cardstock and the Holly Jolly die along with Simply Chartreuse felt. My tag uses the Sentiment Staples: Warmest Wishes stamp set and Skinny Mini Banners once again. These tiny banners come in so handy and I love them already. I created my tag base using the Shape Shifters: Oval 3 die and Kraft cardstock. I stamped the center of my tag using the Frame it Out: Many Blessings stamp set. The wreath was stamped using watermark ink and heat embossed using Shabby Green Embossing Enamel. I added a die cut oval, cut using the Pierced Feature Frames: Oval die once again and added a pink tree from the Fence Line: Winter stamp set and my "To: From" from the Gift Card Cozy Sentiments stamp set. Hello and Happy Sunday! My card today uses a couple of beautiful, new stamp sets from Papertrey Ink, the Glorious Globes: November and Forest Floor: Winter. I layered my stamped and die cut Glorious Globes: November over the Forest Floor: Winter stamped and die cut frame. I then added greenery from the Forest Floor stamp set around the outer edge. I used the Stitch in Time Borders stamp set and die to create a layer behind my globes, adding Sweet Blush pink snowflakes from Glorious Globes to embellish. Another new product releasing this month is the Nesting Frames: Pierced Rectangles die collection. You can see I used it on my Mix & Mat: Confetti die cut, which I added color to by sponging on color in Aqua Mist and Hibiscus Burst. The sweet pierced look adds so much! Once again, I used metallic gold photo corners, cut using dies found in the Make it Market Kit: Fairytale Christmas. All of these lovely new products will be available on November 15th, 10PM EST. Morning! Welcome to Day 1 of the November Release from Papertrey Ink. My first card today uses one of my new favorite stamp sets, the Floral Fantasy: Christmas stamp set and coordinating dies. I love the dancing reindeer in this set and had to use it! I stamped it on metallic gold cardstock using watermark ink and then heat embossed it using white embossing powder. I then die cut it and added stamped and die cut florals around its neck. I stamped in Autumn Rose, Scarlet Jewel, Simply Chartreuse, Prairie Grass, Berry Sorbet, and Honey Nut. I used the new Nesting Basics: Rectangles and Nesting Frames: Pierced Rectangles to create a place for my deer take center stage. In the background, I used the Winter Window stamp set to create my falling snow, stamping it in Classic Kraft. I added my sentiments form the Floral Fantasy: Christmas stamp set, stamping in Scarlet Jewel. I added photo corners, cut using a die from the Make it Market Kit: Fairy Tale Christmas, and a vellum snowflake, cut using the Snowfall Style II die. I added Bitty Big Simply Chartreuse in the background to bring in color and pattern. I am truly smitten with this next stamp set...Enchanted Forest. It is so sweet and completely enjoyable to play with. The trees were just begging me to to be stamped in pink and aqua and I love how they look. I stamped in Hibiscus Burst, Raspberry Fizz, Pale Peony, Aqua Mist, Hawaiian Shores, and Mint Julep. I created a tag with them using the new Shape Shifters: Circle 4 die, which was cut with a white layer attached over a metallic gold layer. Can you tell that gold cardstock is my latest color crush? I stamped my sentiment from the Enchanted Forest set on a die cut Scalloped Tag and adhered it along with vellum Snowfall Style II snowflakes to to the top of my tag and finished with sequins and some gold bling. All of these new products will be available to purchase on November 15th, 10PM EST at Papertrey Ink. Hello! Welcome to my DT Tips for Papertrey Ink this month. I have chosen to create my own "White Christmas" with my cards for you today, sharing how I like to incorporate all things white to create some really special holiday cards. This first card uses the color scheme of Kraft, Stormy Sea, white, and some soft pink. It might just be my most favorite color combination for the holidays. In the background, on my block of Stormy Sea cardstock, you'll see one way I love to incorporate white...by using images that resemble falling snow, combined with white embossing powder. The stamp set I used to achieve this look on both of my cards is from the Background Basics: Celestial Sky....it's a favorite here. On my Kraft cardstock Berry Wreath tag, I used the Berry Wreath stamp set, stamping my wreath in versarmk ink, and then heat embossing the image using Zing! Blush on part and Stampendous Shabby Green Embossing Enamel on the other. You'll notice that I also used the Background Basics: Celestial Sky stamp set on my tag as well. My greeting was stamped in Olive Twist. To embellish my card, I used Snowfall Style II snowflake dies and white glitter cardstock along with pine sprigs cut using the Shaped Sayings: Christmas die. I also used the Branching Out die and Sheer Basics Vellum, swiping the edges across my watermark ink and then heat embossing using white embossing powder. It creates such a soft, frosted look that is a favorite of mine for Christmas. So, to recap a few of my white elements, you'll notice the white glittered snowflake and pine sprigs used here. The heat embossed Branching Out die cut using Sheer Basics Vellum. I clipped my branches apart and tucked them under my buttons to create depth and fulness. And lastly, my frosted die cut tag with the heat embossed Berry Wreath stamped on the front. Even Kraft cardstock can take on a wintery look and feel. After heat embossing my image, I sponged Fresh Snow ink over the top of the image to add more softness. My next card uses the color combination of Kraft, white, gold, Sweet Blush, Spring Moss, and Autumn Rose, with white being one of the main colors. I began with the Mix & Mat: Berry Boughs die, cutting it from matte gold cardstock and once again, swiping the edges over my watermark ink pad and then heat embossing with white embossing powder. I love white and gold together and this creates such a classic, elegant look. I then cut the center image from the Mix & Mat: Berry Boughs die from white cardstock and layered it to the center of my die cut. I heat embossed two bottlebrush trees from the Joyful Christmas stamp set, using Shabby Green Embossing Enamel from Stampendous and Zing! Blush embossing powder. I love the look of heat embossing on Kraft especially using soft, pastel colors. I added some frosted berries in the corner using the Holiday Green stamp set and dies. These remind me of sugared berries once the embossing powder was added around the edges. To finish, I once again added snowflakes cut from white glittered cardstock, this time using the Fancy Flakes die. My sentiment is from the Snowfall Style stamp set and is stamped on a die cut Scalloped Tag. I truly had such a great time creating these to share with you and hope that you'll find a bit of inspiration in them and want to create your own "White Christmas" cards this year. All of the supplies used are linked for you below. Hello! Welcome to the Reverse Confetti November Blog Hop! All of the delightful, new products I've shared over the past few days are now available! I used the new Drink More Coffee stamp set and coordinating Confetti Cuts on my card today, pairing it with the Christmas Candles stamp set. I love the saying found in Christmas Candles and thought it fit perfectly with the cups of hot cocoa for the holidays. I used the Lacy Scalloped Circles Confetti Cut to form my focal point and stamped and layered my images directly onto it. I also used the new Scalloped Bag & Tags Creator with the new Winter Solstice 6x6 paper pad to create my patterned paper layers behind my stamped images. 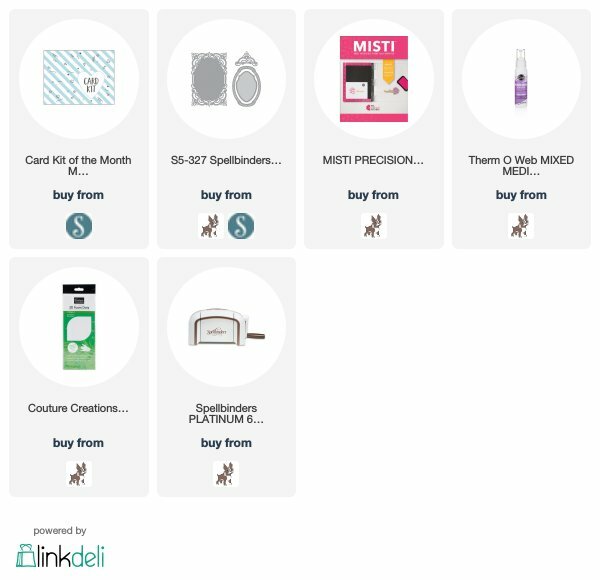 Lots to love this month and now it's time to shop! Today the Reverse Confetti team is introducing the fun, new Snowflake Magic stamp set and coordinating Confetti Cuts. One cannot have too many snowflake sets in my opinion, and this one is playful and unique, not to mention it has such fun sentiments as well. I created a trio of tags using the new Grid Stitched Tag Confetti Cut. They are cut from Polar White cardstock and each has a strip of coordinating paper adhered across the center from the new Winter Solstice 6x6 Paper Pad. I then layered on my dimensional snowflakes, which were stamped in a variety of colors: Piggy Bank, Iced Aqua, Rose, Aqua, Lagoon, Pistachio, and Lime Green. I finished with a few sequins, silver jingle bells, and junk bows tied at the top. I adore the new Snowflake Magic products! They'll be available on November 8th at Reverse Confetti! Morning! Welcome to Day 2 of Reverse Confetti's November Countdown. Today's card uses the new Snow Bunnies stamp set and coordinating dies....so sweet! I began with the new Snowballs Cover Panel in the background, layered over Baby Blue yardstick. Next, I added a strip of patterned paper from the new Winter Solstice 6x6 paper pad. My sweet, skating bunnies were colored using my Copic and layered over a Lacy Scallops Circle, the Fa La La, and Boo to You Confetti Cuts. To finish I added snowflakes cut using the Snowflake Trio dies. 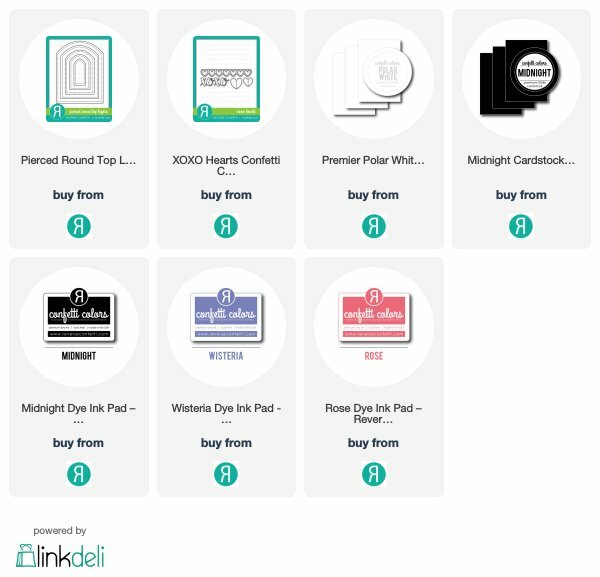 More to see on the Reverse Confetti blog and remember to leave comments in order to be eligible to win some shopping cash at Reverse Confetti! Hello, friends! Today is the first day of the Reverse Confetti November Countdown. This month is going to be such a fun one! I've used the new Christmas Circles stamp set along with the new Scalloped Bag & Tags, Snowballs Cover Panel, and Grid Stitched Tag on my card today. My color scheme centers around the most delightful, new Winter Solstice 6x6 Paper Pad....Love it! You can see the Snowballs Cover Panel used in the background, die cut from Salsa cardstock with a strip of Winter Solstice paper attached across the front of the card. I then added my die cut Grid Stitched Tag which I added color to by sponging on a bit of Piggy Bank and Iced Aqua ink. Next, I added my Christmas Circles stamped images, die cut using the Scalloped Bag & Tags Creator and stamped in Piggy Bank and Iced Aqua. To finish, I added a couple of Triangle Tree images and Snowflake Trio die cuts. Creating for Christmas is so much fun using these sweet, new products! Reverse Confetti is giving away a $15 gift certificate to one blog commenter and one Facebook commenter. Leave message on each designer's blog for more chances to win! Visit the Reverse Confetti blog for more details. Have you heard the exciting news? Fun Stampers Journey and Spellbinders are coming together beginning today, November 1st 2018! 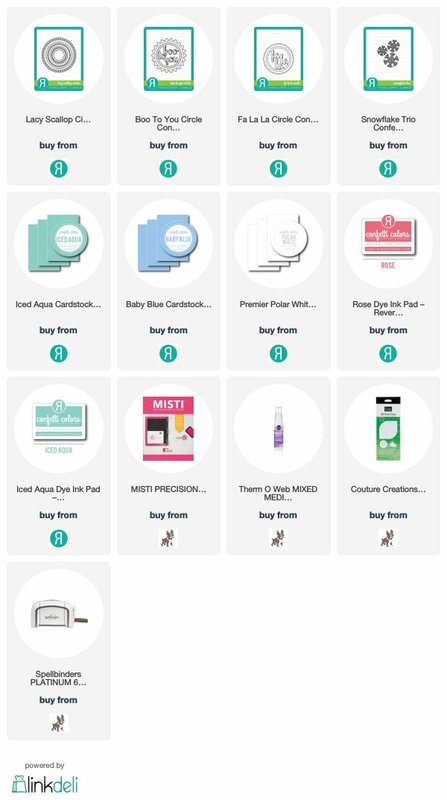 My card today uses products from these amazing companies. I chose to use the beautiful, new Adore Him stamp set and coordinating dies from FSJ. The wise men, palm trees, and Star of Bethlehem are among my most favorite Christmas symbols and this stunning set combines them all so beautifully, not to mention the touching sentiments. I framed in my gold embossed wiseman on his camel by using the Spellbinders Corset Label dies. The bottom layer was cut from gold metallic cardstock with the top layer cut from Stormy Sea cardstock. I heat embossed my Star of Bethlehem in gold and my palms in white and then layered on my wiseman, using dimensional adhesive in order to add depth. I then framed in my images using intricate and detailed dies from the Anabelle's Trousseau and Filigree Veil collections. To finish, I added rhinestones from the Holiday Sparkles package by FSJ. I carried my sentiment to the inside of my card adding it to another die cut Corset Label. I created a second scene using more wisemen, trees, city, and star from the Adore Him stamp set. Such a special group of products! Supplies are listed for you below. Be sure to visit the Spellbinders + FSJ blog for more inspiration! Good morning! Happy November to you! My card today was created for Papertrey Ink and uses the delightful Counting My Blessings stamp set and coordinating dies. I had forgotten just how much I enjoyed creating with this creative group of products. The dies were made to fill in the blank when it comes to the many different sentiments that can be created using the stamp set. I stamped my sentiment above and below my die cut "thankful" using gold foil cardstock. 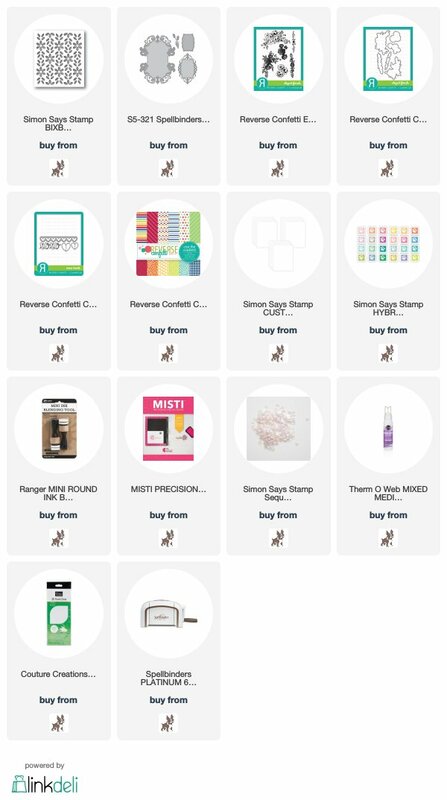 What I love most about the Counting My Blessings products is that you can use them with all off your favorite stamp sets, new and old. I chose to pair mine with the Twig Wreath stamp set and dies. After creating a focal point for my sentiment using the Mix & Mat: Snowflakes die and the Stencil Basics: Dots, I stamped a few images from the Twig Wreath. I then added my wreath, using Kraft cardstock and Cocoa Bean, and then came my large die cut word. To finish, I added stamped and die cut images from Twig Wreath and a few enamel dots, and achieved the fun, dimensional feel that I love. LOVE layers and that's another perk of Counting My Blessings! 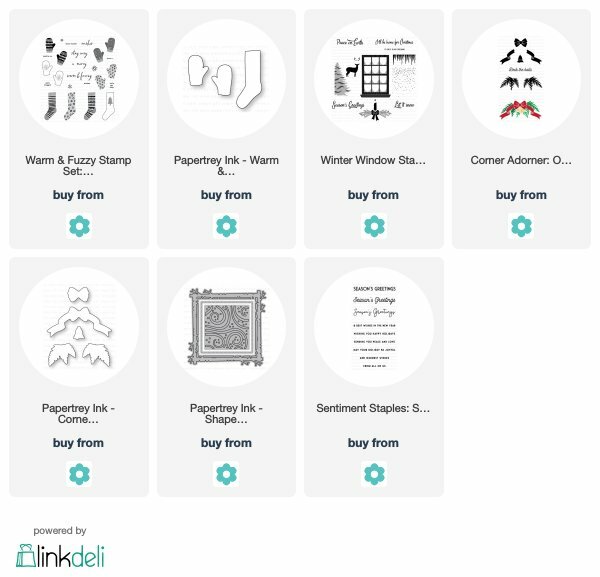 More to see on the Papertrey Ink blog and supplies are listed for you below. Hello! It's been a busy October! My favorite month is flying by and I'm doing my best to enjoy every minute of it :). My card today is one way in which I have been enjoying my October....by having some creative time. I have some beautiful, new Spellbinders products to share with you that I've incorporated on my card. The gorgeous, lacy, frilly, elegant, and intricate snowflakes! Yep, they're from the A Charming Christmas Collection by Becca Feeken. I will without a doubt, love them forever :). I cut them from white glittered cardstock and layered them over a little window scene, stamped and die cut using the Winter Window stamp set and dies from Papertrey Ink. I used the Spellbinders Botanical Frame Cut and Emboss Folder for my background, die cutting it from Stormy Sea cardstock. I wanted the beautiful embossing to show, so I ran my embossed cardstock over watermark ink and then coated it with Shabby Green Embossing Enamel and then heat it up. I love how it looks...soft and swirled, just like snow. I then sponged on white ink to further the soft look and feel. Lastly, I added my ribbon and sentiment, which is from the Penned Elegance: Christmas stamp set from Papertrey Ink. Thanks so much for visiting. Hope to be back soon with more! It's the final day of Papertrey Ink October releases. I think the sweet set we're introducing to you today is so much fun! I created a tag using the new Twinkling Trees stamp set and coordinating dies. I began by using the new Stitched Gift Bag Dies and created my tag base using one of the dies found in this collection. I love that you don't have to use the stitching dies just for your stitching products....they can be used for paper-crafting as well. I stamped several different words from the Twinkling Trees stamp set across the center of my tag using Pure Poppy, Autumn Rose, Scarlet Jewel, and Americana. I then used another of the Stitched Gift Bag dies and created my scalloped oval, cutting it from Pure Poppy. Lastly, I stamped my Twinkling Tree on white cardstock using Prairie Grass and Ripe Avocado. I added a Classic Kraft tree trunk and cream button to finish. All of these new products will be available on October 15th, 10PM EST! Hello! It's another beautiful October day here and we're diving into Christmas once again at Papertrey Ink. My projects today use the lovely, new Blooming Amaryllis stamp set and coordinating dies. I created a gift card holder for my first project. I began with Stamper's Select White Cardstock and the new Folded Pocket Tag Die. I added vellum behind the window and stamped my sentiment from the Blooming Amaryllis stamp set. It was heat embossed using white embossing powder and gives such an elegant look. My flowers were stamped with Harvest Gold as the base layer, Classic Kraft next, and then I heat embossed and used gold shimmer embossing powder as my third layer, finishing with Saffron Spice for the very center. I wish you could see these lovely flowers in person....they have such a gorgeous sparkle to them. They are layered over snowflakes cut using the Snowfall 1 and 2 dies. I used the Pleasing Envelopes stamp set to embellish the corners of my gift card holder. I used the potted amaryllis on my second card. I love the shabby pot included in the stamp set. My flowers were stamped with Autumn Rose for the base layer, followed by Raspberry Fizz, and ending with Scarlet Jewel. The centers are stamped in Stormy Sea. The leaves were stamped in Prairie Grass with Pinefeather used for the detailing. And, the pot was stamped using Vintage Jadeite with Saffron Spice used for the weathering. My amaryllis was layered over a Bitty Big Pale Peony Pierced Feature Frame die cut that was layering over script patterned paper. Once again I used images from the Pleasing Envelopes stamp set to embellish the corners, stamping gin Spring Moss, Prairie Grass, and Autumn Rose. Blooming Amaryllis is very versatile, with sentiments suitable for Christmas and every day occasions. My last card uses the new Say it Simply: Merry & Bright die. It was cut from Pure Poppy cardstock and layered over a die cut Scallop Stackers: Medium die. I added color to my scallop base using Summer Sunrise and Mint Julep. My amaryllis were stamped in Sweet Blush, Pure Poppy, Autumn Rose, and Scarlet Jewel. I added stamped and die cut images from the Corner Adorner: October and Sending Joy sets to create more fullness. Lastly, I layered my scallops over a layer of Bitty Big Spring Moss to bring in a bit of pattern. Truly, such a gorgeous stamp set and stunning die for the holidays! All supplies will be available on October 15th, 10PM EST. Morning! Welcome to Day 3 of the October Papertrey Ink Release...it's another fun one! My first card uses the new Glorious Globes: October stamp set and coordinating dies along with the Words to Live By: Peace. These may be my most favorite sets of both series. I layered my die cut Limitless Layers: 2 1/4" Hearts over the new Shape Shifters: Square 3 die. Across the bottom, I used the gingham image from the Sending Joy stamp set. My little wreath and bird are from the Glorious Globes: October stamp set and I used Nuvo Crystal Drops in Simply White to add my berries. My sentiment was stamped in Olive Twist and across the bottom I added a tone on tone Pure Poppy sentiment from the Sentiment Staples: Merry Christmas stamp set. My next card uses the darling, new Warmer Together stamp set and dies. Aren't those tiny penguins so much fun for Christmas and Winter cards? The new Bold Borders: Flurries dies were used to create my Smokey Shadow background and "joy" cut from Aqua Mist. I added Bitty Big Sweet Blush and Aqua Mist down the center. My penguins are stamped in Sweet Blush, Melon Berry, True Black, and Saffron Spice. I layered them over a die cut Shape Shifters Circle 3 die and added pink snow flurries and hearts finish. There's plenty more to see by visiting the Papertrey Ink blog. All of these new supplies will be available on October 15th, 10Pm EST. It's Day 2 of Papertrey Ink's October countdown and today's new products are irresistibly sweet! My first card uses the new Warm & Fuzzy stamp set and coordinating dies. I love the mixed fonts, with the tiny type font used throughout, allowing you to mix and match and customize. I stamped my sentiment on a die cut Scalloped Tag. I also used the new Shape Shifters: Square 3 die, cutting it from Aqua Mist cardstock and layering it over a block of white cardstock, allowing the pattern to show from behind my stockings. My sweet stockings were stamped in Aqua Mist, Pure Poppy, and Fine Linen, with the snowflake stamped in Olive Twist. I added in some Bitty Big Pure Poppy paper to bring in additional pattern and color. My next card uses more of the Warm & Fuzzy stamp set, but I've mixed it with the darling Corner Adorner: October stamp set and coordinating dies. I used the Scallop Stackers: Medium die as my card base along with Kraft cardstock. My Corner Adorner: October images were stamped in Green Parakeet, Prairie Grass, Autumn Rose, Saffron Spice, and Olive Twist. I layered them on a die cut Scalloped Tag, repeating the leafy green images there, stamping them in Spring Moss. The berries are from the Pleasing Envelopes stamp set. My sentiment is from the new Sentiment Staples: Season's Greeting stamp set and this particular one coordinated perfectly with the images I chose to use :). The snow at the top of both of my cards is my favorite thing to add lately! It is from another new set you'll be hearing much more about very soon. Hello, friends! Are you ready for the sweetest, most irresistible, new Papertrey Ink products? My mind has been blown this month! My first card uses the darling, new Fawn & Flora stamp set....I am totally enamored with this set! The sentiments are so creative and endearing....they make the stamp set even more special. And...they fit perfectly on the Scalloped Tags. My sweet fawn was stamped on Sweet Blush cardstock using Fine Linen ink as the base layer and Saffron Spice for the darker, detailed areas. I used Olive Twist for the eyes and nose. The flowers were stamped in Melon Berry, Berry Sorbet, Autumn Rose, Spring Moss, and Ocean Tides. My next card uses the beautiful, new Pleasing Envelopes stamp set....it's beautiful! The flowers across the bottom of my card are from this set, stamping in Berry Sorbet, Melon Berry, Autumn Rose, Mint Julep, Spring Moss, Prairie Grass, Classic Kraft, and Ocean Tides. I created the focal point for me card using the Shape Shifters: Circle 3 die and Sweet Blush cardstock. The tiny, snowy dots stamped near the top are from the Pleasing Envelopes stamp set as well. I then layered on snowflakes cut using the Snowfall Style 2 dies and Silver White Wishes dies, cutting them from Bitty Big Mint Julep and Stamper's Select White, and glitter cardstock. The center of my snowflakes were embellished using stamps and dies from the new Sending Joy stamp set, stamping in Spring Moss, Prairie Grass, and Autumn Rose. In the background you can see my coordinating envelope, stamped using only images from the Pleasing Envelopes stamp set. There's so much to love about Pleasing Envelopes....this one will be getting a workout, not only for the holidays, but year-round. Dressing up envelopes is such a special way to make your holiday cards spectacular! Lastly, I created a gift card holder using the new Sending Joy stamp set and coordinating dies along with the new Folded Pocket Tag Die....this thing is so much fun! The set comes with an oval and rectangular window. Before die cutting my oval window from my tag, I stamped my cute gingham border in Pure Poppy across the bottom. I then assembled my tag and embellished using images from the Sending Joy stamp set. I created a coordinating tag that slips inside the gift card holder, covering up the gift card. Once again, I used the Scalloped Tag die for this. Inside I added some Bitty Big: Spring Moss paper, to show contrast through the window. Most defnitely, a bunch of fun and playful products this month....available on October 15th, 10PM EST. Hello and Happy Fall-idays! The Reverse Confetti team has one last day of fun, festive creations for you! I used the Reverse Confetti Clear Totes for my project, adding a handmade tag to dress it up for the holidays. My tag base was made using the Lacy Scallop Circles Confetti Cuts and Polar Cardstock. I then added a die cut Leafy Wreath cut from patterned paper. I dressed up my wreath by using the Vintage Ornaments stamp set and coordinating Confetti Cuts as well as the Christmas Candles stamp set with coordinating Confetti Cuts. I added a few sequins here and there as berries. Lastly, I die cut snowflakes using the Snowflake Trio Confetti Cuts and Salsa cardstock and added them to my tag to finish. Tags are a second love for me and creating them in a variety of shapes makes them even more fun. 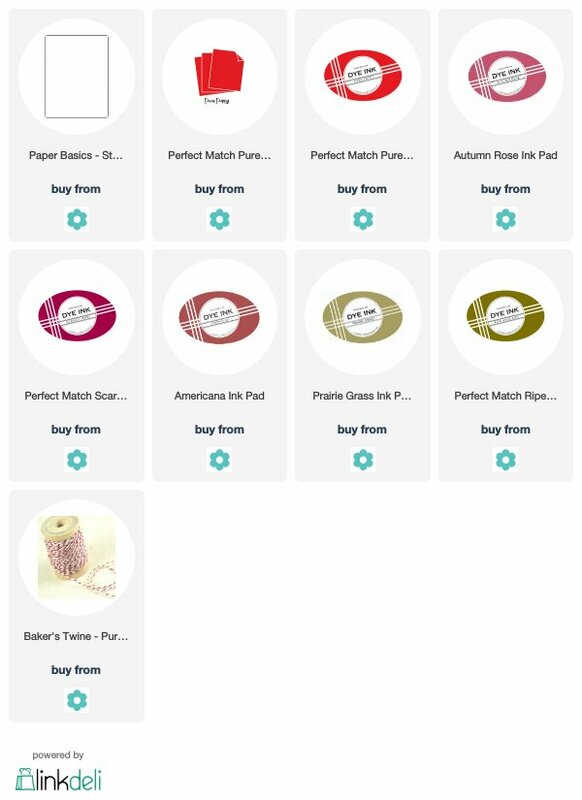 Be sure to follow along on the blogs listed below and my supplies are also listed for you as well. Hello! We at Reverse Confetti are having a fun, Fall-idays blog hop over the next few days. My cards today are all about autumn and Halloween and I have loved using my Reverse Confetti supplies to celebrate this special time of year. I used the gorgeous Fall Foliage stamp set and coordinating Confetti Cuts on my first card. I stamped the images in watermark ink and then heat embossed them with gold embossing powder. I then added color using ink blending and a few speckles created with embossing enamel once I was finished. I love adding in pinks and purples for autumn and these images are perfect for sponging on some fun and unique colors for fall. I used a sentiment from the Autumn Blessings stamp set, paper from the Cheerful & Kind 6x6 paper pad, and the sweet Small Diamond Cover Penal in the background. My next card uses the darling ghost and pumpkin from the Frightening Friends stamp set with the coordinating Confetti Cuts. I stamped the spooky trees, clouds, and moon in the background on a block of Midnight cardstock. I cut the panel for the front of my card along with the two strips of coordinating paper using the Bag & Tags Creator Confetti Cuts. I love creating Halloween cards with the sweet and whimsical images from the Frightening Friends stamp set....Halloween will be here and gone before we know it, so create your heart out while you can :). 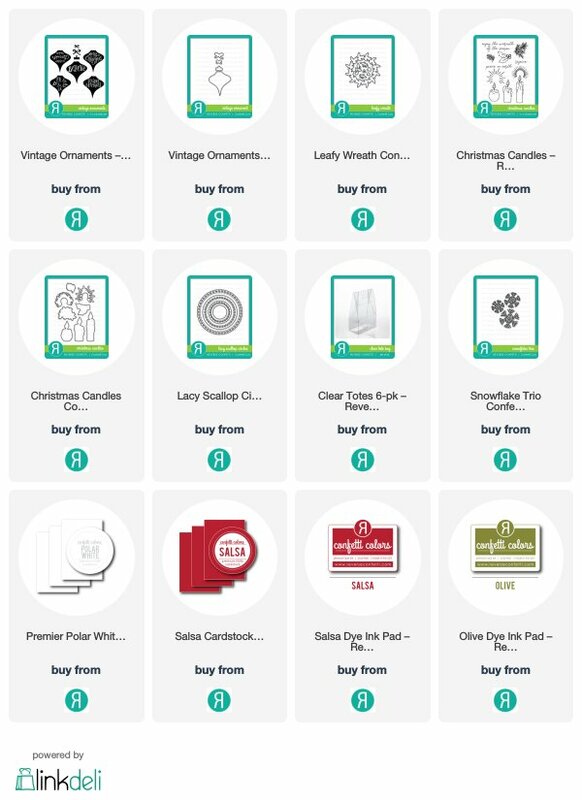 Supplies are all listed for you below and hop along by following the links below as well. Hello, friends! I'm here with an autumn card created for Papertrey Ink's Throwback Thursday feature. We are pulling out the beautiful Wreath for All Seasons stamp set....an all-time favorite of mine. I began by stamping wreaths on a Mix & Mat: Pinked Edge die cut. I stamped in Classic Kraft, Autumn Rose, Honey Nut, and Summer Sunrise. I then inked the edges of my die cut to allow it to stand out from the background just a bit. Next, I die cut a Scalloped Tag from Kraft cardstock. I then stamped my wreath in Cocoa Bean with the berries in Americana. My sentiment was heat embossed across the center of my wreath using gold embossing powder. To finish, I added patterned paper across the center and added my tag using dimensional adhesive, and lastly, added a junk bow at the top. I already have another project in the works using this beloved stamp set...can't put it away just yet! 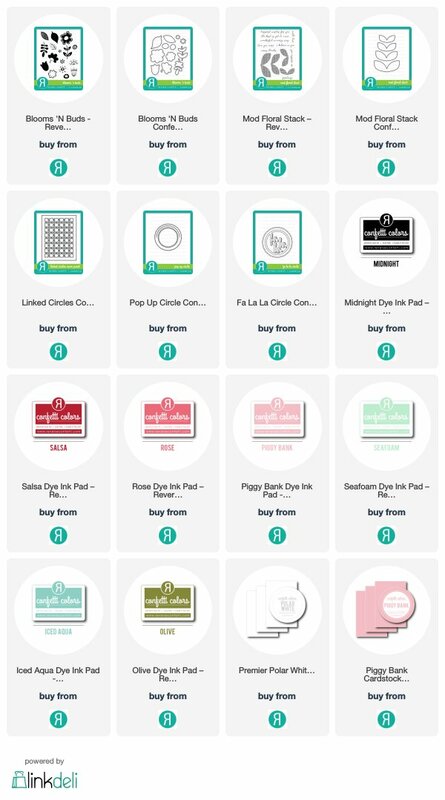 All of the supplies are listed for you below and be sure to check out the Papertrey Ink blog to see more from other designers.